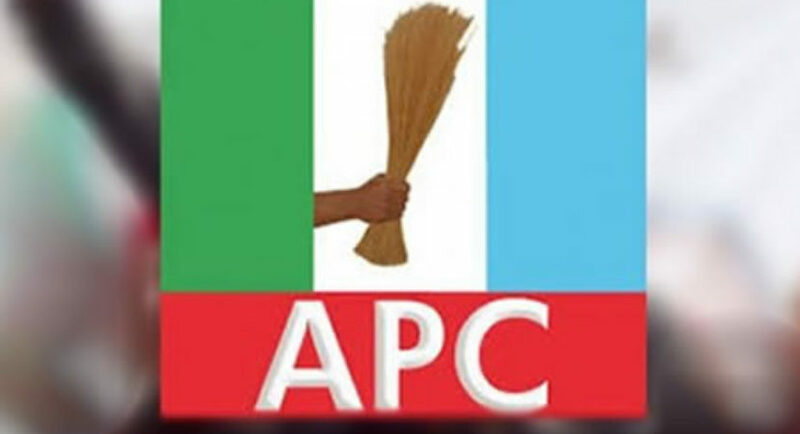 In its continued desperate drive to infamy since losing the governorship election on March 9, the All Progressives Congress (APC) in Abia State, has reactivated its machinery of falsehood and rehired its mercenaries of sophistry. All the lies currently being peddled by these forces are so infantile that what the APC in Abia State gets in return for their unabated mendacious scripts from the generality of Abians is nothing but pity for a sinking ship loaded with drowning passengers and their rudderless sailors. Starting with the road projects, it is an undisputable fact that Governor Okezie Ikpeazu is reputed to be one of the leading governors in the area of road construction in the country. This surely accounts for why he was the only southeast governor invited by President Muhammadu Buhari of the APC-led federal government to the signing of Executive Order 007 (Road Infrastructure Development and Refurbishment Investment Tax Credit Scheme) on January 26, 2019, in Abuja. Sadly, while President Buhari of APC appreciates the Abia State Governor for his giant strides in road construction and rehabilitation, his subjects of the same party in Abia are making futile attempts to deny the undeniable. 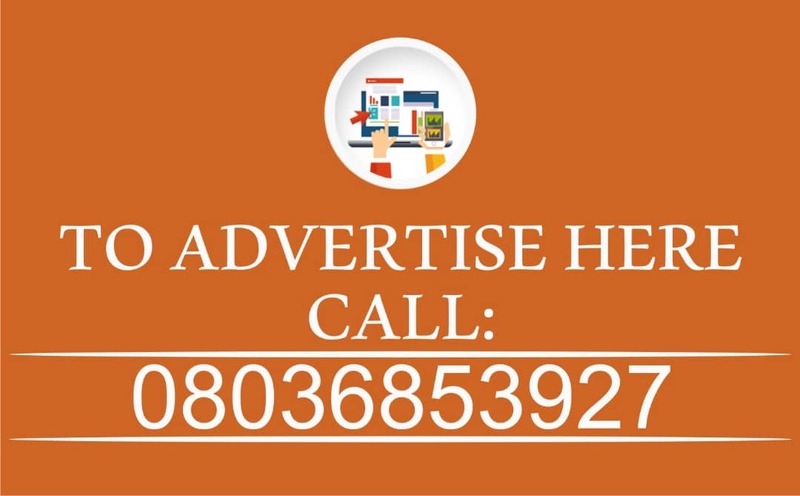 On Faulks Road, for every project of the federal government anywhere in Nigeria, there are notices to that effect on the project sites. Pray, the same people who saw “SUKUK” on the Okigwe to Umuahia Road could not find such a sign on Faulks Road built wholly, fully and entirely by the Ikpeazu-led Abia State government, yet, they attempt to credit it to the FG. This is the same road for which Abia APC roundly criticised Ikpeazu during the election campaigns; they never believed he could do the road that had defied any permanent solutions by past administrations. But they have now shamelessly turned around to arrogate its construction to FG just because the Governor has done it and they must lie to attempt to deny him his due credit. For the records, Dr Okezie Ikpeazu completed over 70 road projects across the state with over 90 others at their respective stages of completion. On the military uniforms and boots being ordered for our military from Aba shoemakers and garment merchants, Abia APC is making it look like the federal government suddenly woke up from slumber and started patronising Abia entrepreneurs. The question Abians are asking APC in the State is, why did such orders and patronage from FG not happen in the past? It is simply because we have a current Governor who is personally and sacrificially committed to the enhancement and promotion of the “Made in Aba” brand to the extent that he personally takes products made in Abia State to showcase and market in Aso Rock and other places, convinced the presidency and other high net worth individuals/organisations that Abia is up to the task of providing such foot and garment wears, scientific and technological inventions and invitations including all forms of metal fabrication etc. This, among other things, caused the Buhari-led federal government to sign Executive Order 005 for “Planning and Execution of Projects, Promotion of Nigerian Content in Contracts and Science, Engineering and Technology”, which basically requires that no government MDA imports any product/service into Nigeria without first finding out if such product/service can be produced in Aba in particular and Nigeria in general. 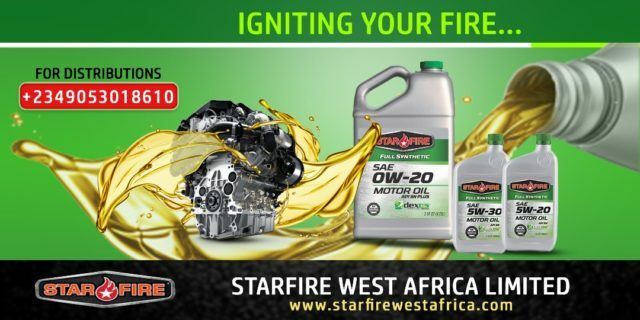 Since then, Abia made products have been in hot demand not only from the federal government and the military but also our paramilitary organisations, and throughout the world. On the school feeding programme, what Abia APC will not tell Abians is that Governor Okezie Ikpeazu was the first governor to have started the school feeding programme with pupils of Primary 1 – 3 before FG started its throughout the federation for the same level of pupils. Rather than leave it there, Dr Ikpeazu continued the school feeding programme for pupils of Primary 4 – 6, hence, making Abia the only State in the entire federation where all pupils of primary school are fed every school day till today. No other State, no matter how financially endowed, has that record. In order not to further ridicule themselves before Abians, the APC lying machines deliberately skipped mentioning the fact that since 2015 when Governor Ikpeazu first assumed office, Abia State came first in WASSCE throughout the federation and has maintained that position in 2016, 2017, 2018 and still counting despite keen competition from other better financially endowed states, and that school enrolment rate has greatly increased from about 100,000 in 2015 to a huge over 600,000 as at 2018. 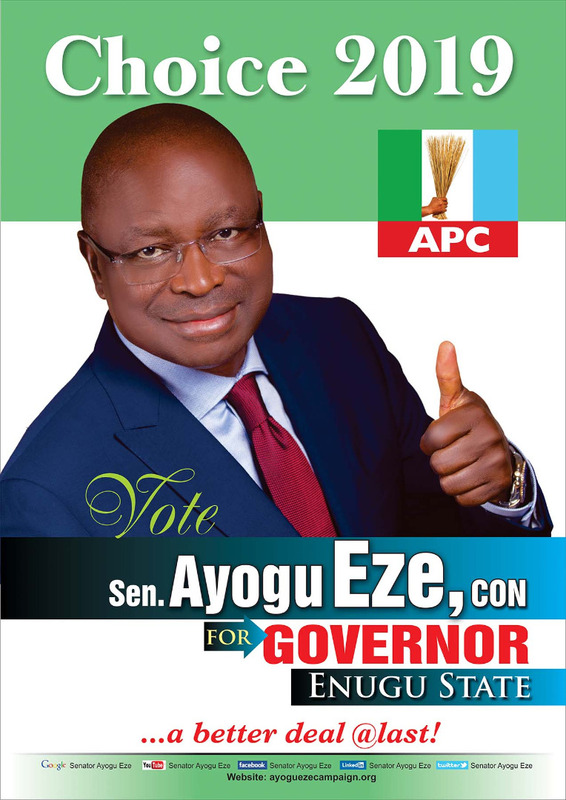 Finally, the Enyimba Economic City (EEC), is one humongous legacy project of Dr Okezie Ikpeazu that is, understandably, the most troubling to Abia APC because they cannot fathom how the Governor conceived and drove such a complex and gargantuan project that is the delight of global investors to its current level of success even before its groundbreaking to the extent that the APC-led FG and renowned investors from all over the world have already invested billions of naira in it. Before the elections, Abia APC tried in vain to confuse Abians that the EEC existed only on paper. They called it a phantom project and said all manner of things against the governor and the project, which has rightly been dubbed “The Dubai of Africa” by discerning investors and stakeholders, just to score cheap political points. But today, having failed in that bid, they have turned around to claim that the EEC is a product of FG partnership with “foreign partners”. Nothing can be further from the truth and nothing can further expose leaders of APC in Abia State as political illiterates who know nothing about the State they so desperately but futilely desire to govern. At the signing of the Definitive Agreement in Abuja in December 2018, President Buhari specifically thanked Governor Okezie Ikpeazu for INITIATING the EEC. Most newspaper headlines for the signing ceremony read “FG, Abia, Sign Deal for N500bn Enyimba Economic City”. None read “FG, Foreign Partners, Sign Deal on Enyimba Economic City” because the EEC is the initiative of Dr Okezie Ikpeazu, and because of its humongous nature and scope as an export zone, it was only natural that the federal government be carried along to ease licensing processes among other things. The most laughable aspect of Abia APC’s ignorance is that while they were busy denying the existence of the EEC, calling it a “waste” among other things, their more discerning and patriotic leaders at the federal government level, were busy fighting to own a share of the City by setting aside a whopping N10bn from the 2019 budget as its initial investment. While President Buhari was in China to scout for investors, Mr Yafu Qui, Chairman, Ruyi Group, Ms Aiying Li, President Ruyi Power Group and Mr Limin Sin, President Ruyi Textile Group, told the President that apart from three other States in Nigeria, they were already investing in the EEC, Aba, Abia State. Ruyi Group is the largest textile manufacturer in the whole world. Since then, other investors have been trooping into Abia State as the state will soon start to harvest the benefits of these huge foreign direct investment inflows through the massive infrastructural development and job creations that will follow. For example, the EEC alone is earmarked to employ over 625,000 people when fully operational. For close followers of events in Abia, this is not surprising because Governor Ikpeazu has created the needed enabling environment for investors to come to the state and for their investments to thrive, hence, Abia was ranked by the World Bank as one of the best five States who have put in place the best policies for Ease of Doing Business. Abia State under Dr OKezie Ikpeazu was officially named by the National Bureau of Statistics as the State with the third highest foreign direct investment inflow in the entire federation only after Abuja and Lagos. It is in light of the above that the APC-led federal government gave Governor Okezie Ikpeazu an award last year as the SME-Most Friendly Governor. It is also for these reasons that reputable media organizations like Vanguard, Authority Daily Newspaper, Verbatim Magazine, and Africa Independent Television (AIT) have not stopped giving him awards. Just last week, precisely on Wednesday, April 3, Governor Ikpeazu was bestowed with, yet, another award by the World Bank-backed Presidential Enabling Business Environment Council (PEBEC) as organized by the APC-led federal government, at the Presidential Villa, for his giant strides in investment drive and favourable regulatory reforms in the business sector. 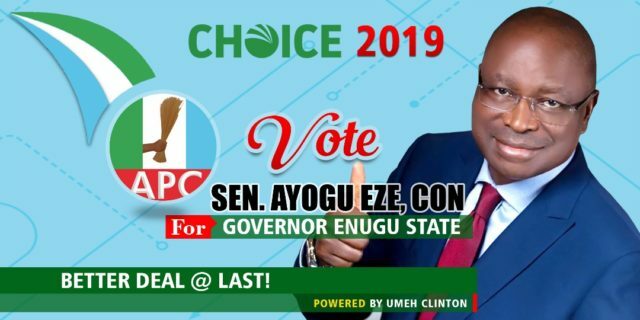 While Abia APC are writhing in pains over the continued enviable achievements of Dr Ikpeazu, the more patriotic APC at the federal government level cannot just celebrating this governor with uncommon vision and achievements. 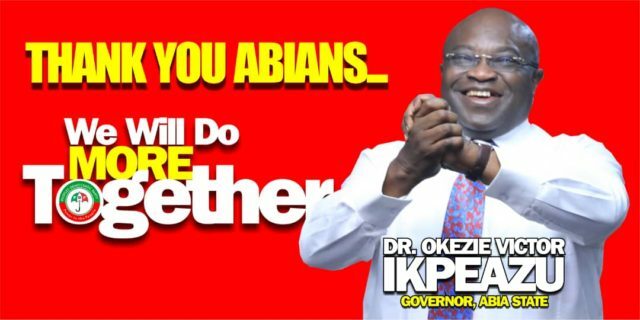 The ultimate reward for all his hard work came on March 9, when the Abia masses spoke loudly and clearly by overwhelmingly returning Dr Okezie Ikpeazu to office for a second tenure in what has come to be known as the freest, fairest, most transparent, most credible and most violence-free election in the history of Abia State, thereby, totally rejecting all the puerile lies and infantile propaganda of Abia APC, Uche Ogah, its failed governorship candidate and their leaders in the State. Should they be politically discerning, they would know that this is the time to stop driving themselves into infamy before they go beyond it into the abyss of political self-annihilation.